The 2015 Nuits Saint Georges Village, a blend on different small blocks between the south and middle of the appellation, offers a fragrant, well-defined bouquet with red cherries and cranberry fruit. There is impressive mineralite and transparency considering this is a "mere" village cru. The palate is medium-bodied with crisp tannin, tart cherries mixed with bergamot and hints of early grey. I appreciate the complexity here and it marks a significant step up from the Bourgogne Rouge. The 2015 Nuits Saint Georges 1er Cru Les Chaignots has a generous, lively bouquet with dark cherries, a hint of blackcurrant and cold stone - very defined with good fruite. The palate is medium-bodied with succulent ripe red cherry and cranberry fruit. It possesses an agreeable sense of reserve towards the second half: more structured with grainy tannins and a chalkiness lingering on the aftertaste. Mugneret-Gibourg aside, Les Chaignots does get better than this. This is an outstanding effort. The 2009 Nuits St. Georges Les Chaignots (from the northern side of the village) emerges from the glass with crushed flowers, spices and gently perfumed fruit. This is a relatively feminine, delicate style of Nuits, with silky tannins and terrific overall balance. A final burst of red fruit informs the finish. The Chaignots was bottled mid-January 2011. Anticipated maturity: 2019-2029. 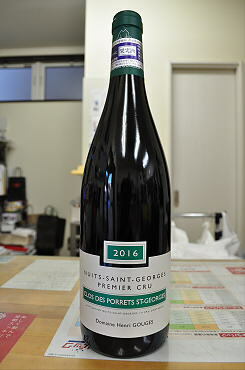 The 2016 Nuits Saint Georges 1er Cru Clos des Porrets Saint Georges, matured in 20% new oak, offers attractive dusky black berries on the nose mixed with cold black tea and bay leaf. Give it a couple of swirls and a lovely crushed rose petal note leaps from the glass. The palate is medium-bodied with supple tannin, finely judged acidity, a little grainy in texture toward the finish. There are wonderful pure black and red fruits with a vein of blood orange on the finish. Though not as good as the 2015 maybe, this remains a fine contribution to the vintage. The 2015 Nuits Saint Georges 1er Cru Les Pruliers has a more feminine, more fruit-driven bouquet than the NSG Clos des Porrets, very pure crushed strawberry, red cherry and cranberry aromas that gain intensity all the time in the glass. The palate is medium-bodied with blood orange on the entry, plenty of lively red berry fruit with admirable mineralite and tension on the finish. This is a superb les Pruliers from Domaine Gouges and it should give a couple decades worth of drinking pleasure. The 2009 Nuits St. Georges Les Pruliers is striking in its beauty. It boasts gorgeous weight and energy in an effortless style that is hugely appealing. Dark cherries, flowers, mint and crushed rocks are all woven together nicely in this energetic, vibrant Pruliers. The 2009 is drinking well today, but it will be even better in a few years’ time. There is an exotic, at times airy, quality to the finish that is very attractive. Anticipated maturity: 2017-2029. Another vividly red-fruited as well as red meaty and tight, bright, yet silken-textured essay, the Gouges 2008 Nuits-St.-Georges Les St.-Georges incorporates piquant sage, black pepper, toasted nuts, salt, and fruit pits in its long, lip-smacking finish. There are low-toned dimensions of roasted red meats and peat as well as an emerging, decadent inner-mouth aura of floral perfume that take one beyond the complexities of the corresponding Vaucrains, and at the same time - notwithstanding bright fresh fruit vivacity ? lend a sense of substantiality note found in any of the other Gouges 2008s. I would expect this to perform well for 15 or more years. The 2005 Nuits-St.-Georges Les St.-Georges displays a fascinating nose of black cherry, wood smoke, sandalwood, and sea breeze. Rich, deep, charred meat, toasted nut, lightly-cooked black fruit and myriad mineral notes lead to a palate-saturating spread of flavors, finishing vividly bright and above all ? with its elements of wet stone, salts, iodine and ore-like if ineffable essences ? memorably mineral. Fine-grained in tannin and formidably concentrated, this should be at least a twenty-year wine, revealing plenty of additional nuance along the way. The 2004 version, incidentally, is also serious and worth tracking down and cellaring for a few years.